A couple of weeks ago I got my skates sharpened and wanted to test them out. A cold Family Day was the just the time to do it! 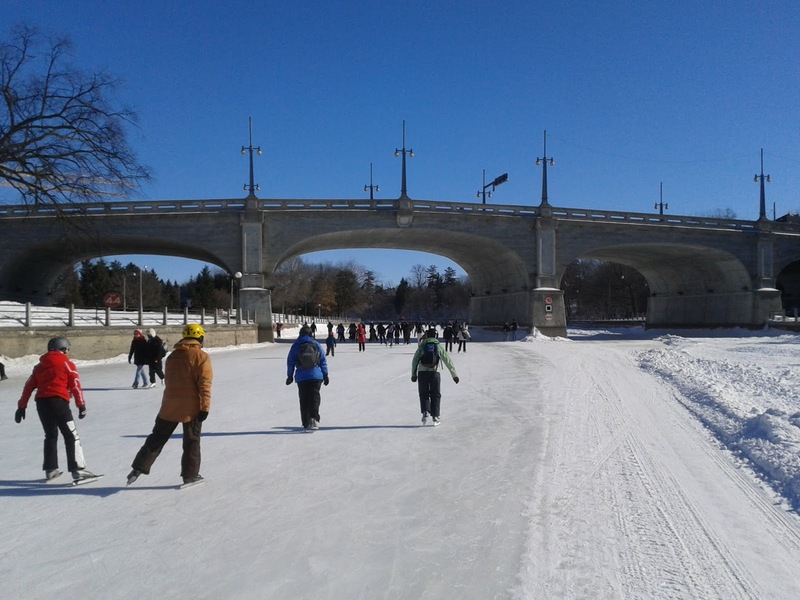 Rideau Canal Skateway near Somerset Street. 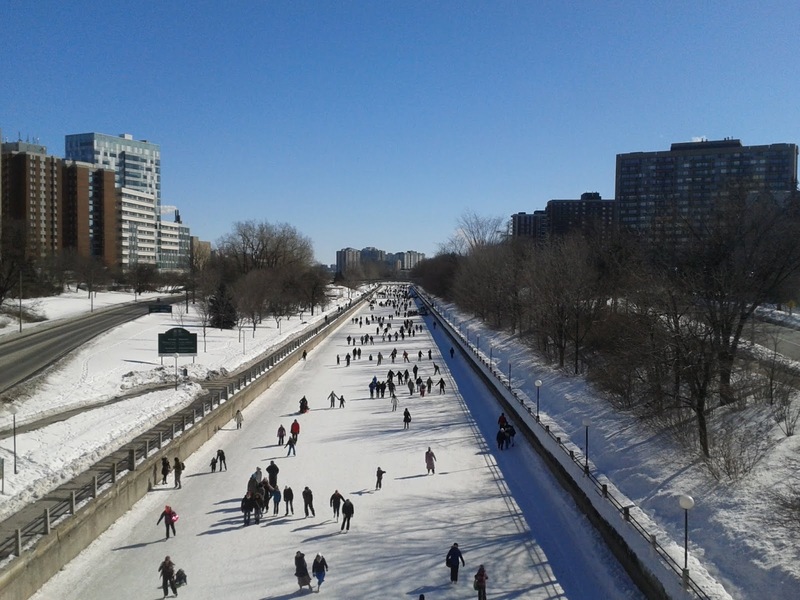 I started near the Somerset Street Bridge instead of near the National Arts Centre (NAC) as this area is usually congested with tourists, Beavertail Connoisseurs and those putting on their skates. It is a great area to avoid as normally this is the area with the worst ice on the Canal due to the volume of people. I skated southward and picked up a Beavertail at the Fifth Avenue Rest area and opposite that Nabob was handing out free coffee to skaters passing by. I continued southwards passing families big and small. Everything from 4 year olds who obviously grew up on blades racing down the canal to others who were toddling along doing the odd faceplant. The usual annoying wall of four people across doing about half the speed of many others were also overcome with some interesting maneuvering to pass them. I finished skating near Bank Street bridge which was about 3.5 Kilometers south from where I started. I found a spot to take off my skates and reacquaint my feet with my boots. As I was removing my skates, a father, son and daughter were putting their skates on. The daughter had hers on first and zipped off to do a few rounds of the area while waiting for the other two to catch up. 4 year old son was next. He toddled a little bit in the area while Dad put his skates on. 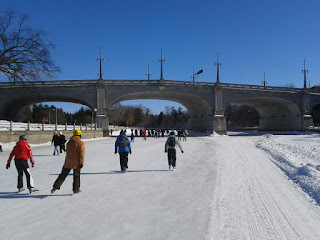 The son toddle over and looked at the Rideau Canal Skateway map which was surrounded by a little snow plowed from the ice. He looked over the map and then tried moving again only to find himself tumbling over onto his back. Of course there were tears. No sign of big sister returning to her little brother's aid. But his father calmly came over and picked up son and put him back on the ice feet first. The kid let the world know that less than 5 minutes on skates he was done. A little smile came across my face knowing this father was in a predicament. Does he take the son's skates off? What does he do with sister? Is this the end? Not so fast, they brought the sled. Not sure what happened as I got up and left towards Bank Street to continue on with my day. But I imagine the father left son's skates and placed him in the sled and went off to find sister. Son probably later retook to his feet to enjoy skating just like his older sister. I continued northwards along Bank Street. I stopped off at Kettleman's Bagels looking for a bagel and coffee. The place was lined up out the door! I continued northward to Bridgehead to grab a coffee. I then left there still feeling a little hungry but at least warmed up with my medium black coffee. I boarded an OC Transpo Route 7 bus to Laurier Avenue. I continued across Laurier to Ottawa City Hall to attend the Mayor's Family Day celebration. There was free soup and hot chocolate as well as skating on the Rink of Dreams. 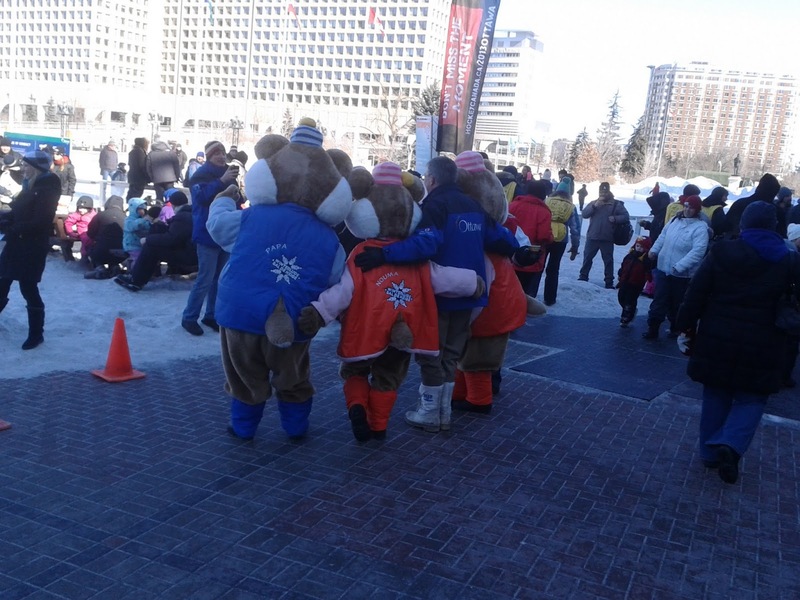 Mascots from Winterlude and City programs were both cheering and frightening the little ankle biters out there. The soup was delicious with each person leaving with a cup full of the heartwarming elixir. 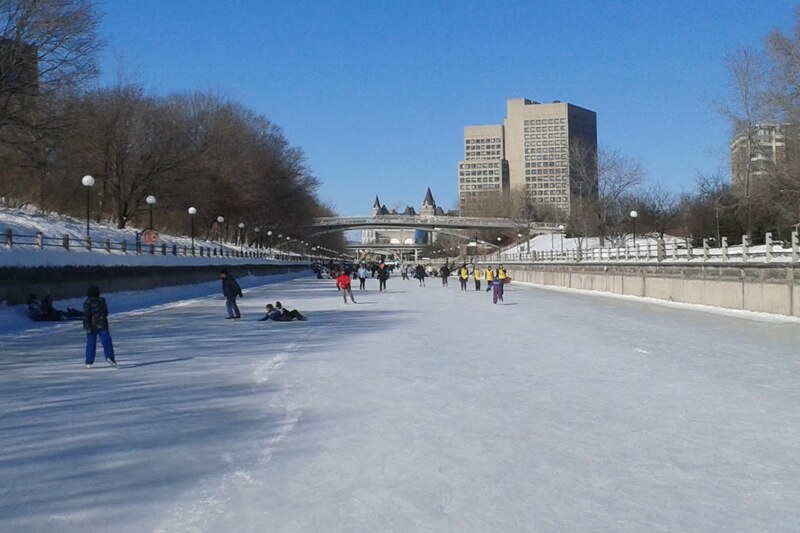 This being a skating day for myself and many others, there was one place in Ottawa to attend. 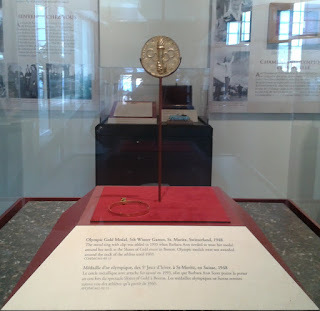 Inside City Hall is the Barbara Ann Scott Gallery holding the memorabilia of Scott's extensive figure skating career including the 1948 Olympic Gold Medal from St. Moritz, Switzerland Games. It was nice to warm up in Ottawa's City Hall. City Hall has plenty to look with not only the Barbara Ann Scott Gallery but also an art gallery that rotates through works by local artists on a monthly basis. As well tourist information and OC Transpo information are also available. It is quite the place to visit both inside and out. I continued eastward along Laurier Avenue over the Rideau Canal Bridge to end my morning skate adventure along the Rideau Canal.